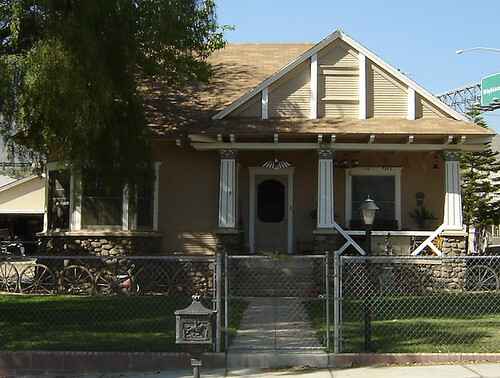 …and the awesome house I grew up in. 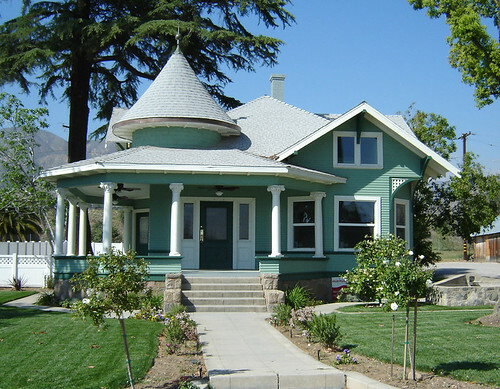 This year it turned 100 and celebrated by being the featured home on the Tour of Historical Homes during the Highland (CA) Citrus Harvest Festival which pleased my mom to no end. 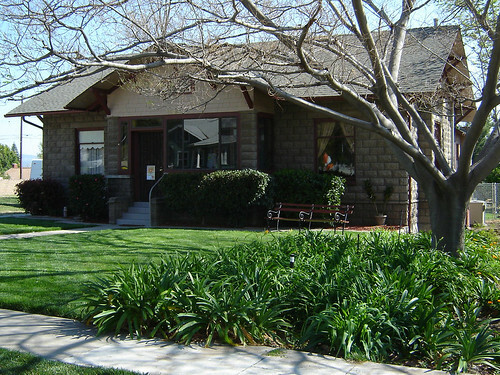 Growing up in a turn-of-the-century home on a half-acre was a fascinating experience (especially for a native Southern Californian). There was no central air and heat. We had loads of windows and one centralized floor heater. We also had a basement (how many homes in CA can boast one of those? ), and it was the coolest spot in the summertime. When we moved there in 1974, it had a “forest” of Christmas trees (Monterey pines) on the east side of the house, and a navel orange grove directly behind it. It took 2 years of selling Christmas trees to clear the east lot, where mom then planned and planted an extensive vegetable garden, strawberry patch, boysenberry patch and fruit tree orchard year after year. There were some lean years where those home-grown fruits and veggies sure came in handy, even if I did hate all the weeding and pine-needle mulching (so much that mom joked that I was allergic to it…well, it was funny because, as a kid, I seemed to be allergic to EVERYTHING). The Aplin House which is across the street from my parent’s house has recently been restored. I think it was built about the same time as my parent’s house. I don’t know the history of this house, except that, for a time it housed a family with 3 boys who I used to babysit while I was in high school. I don’t know the current residents. But it looks cool, so I took a picture of it. 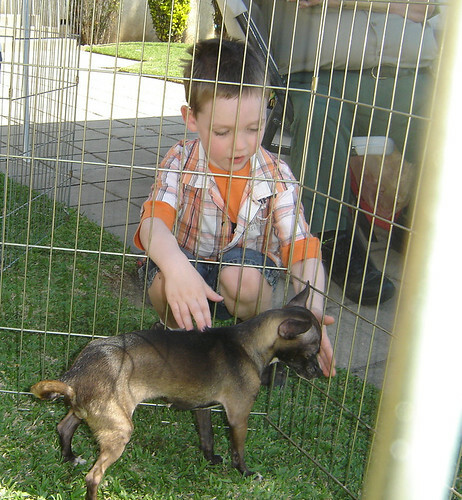 At the Citrus Festival The Humane Society had a couple of small pens that held dogs for adoption. I think that there were 6 dogs in all, and last I checked, every single one of them got adopted! I was just amazed that my hell-bent-for-leather in everything he does, pinging-off-the-walls-can’t-stand-still-he’s-so-energetic 3 year old all-boy nephew wanted nothing more than to sit quietly and gently pet this puppy, and would have done so for hours if his dad would have let him. My brother needs to unclench and adopt this boy a dog! I think he’s forgotten how full our lives were growing up with our constantly stream of strays that came to live with us…dogs and cats that went by the names of Night Rider, Ashes, Crystal, Heidi, Snow-ball, Kizzie (he named that one), and Truck Face (yeah, that one too…Persian-mix). I mean, how can he possibly resist this?